Port Hueneme, CA – The action in Hollywood is getting absolutely explosive, inching closer and closer to the finals of the annual PP3 Cup Memorial Tournament! 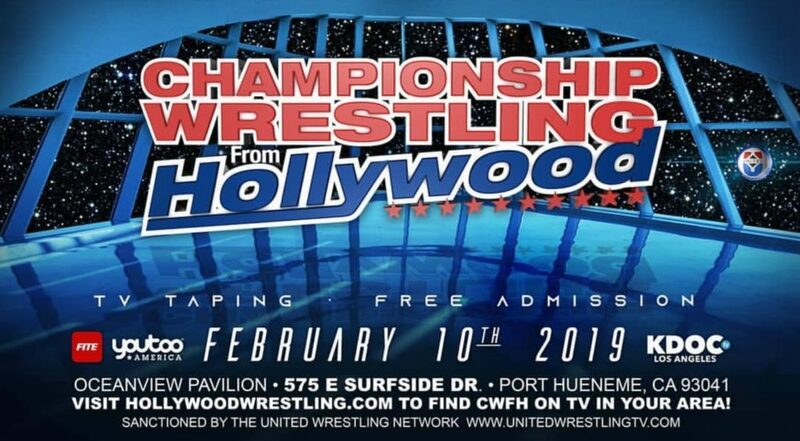 On February 10th, Championship Wrestling from Hollywood returns to the Oceanview Pavilion with a pair of championship dream matches, as well as the last PP3 Cup match before the finals! Jamie Iovine has been slowly losing his grip on his fantasy of monopolizing all of the titles in Championship Wrestling from Hollywood. Not only did Royce Isaacs lose his Hollywood Heritage Title, but Double Platinum came up short in their bid to capture the vacant United World Tag Team Titles. There is but one championship left in the Iovine camp, and that’s Royce Isaacs’ United Television Title. Isaacs will be looking to prove to the fans of Hollywood that he hasn’t lost a single step, when he defends the TV Title against another former Television Champion, Ryan Taylor. The rivalry between the ROCKNES MONSTERS and Double Platinum is getting more heated than ever. Sources say that Chris Bey and Suede Thompson were overheard plotting their revenge after losing to the team of ROCKNES and Andy Brown in six-man action alongside Royce Isaacs. On February 10th, YUMA and BHK will have a chance to silence their foes in singles action; YUMA will go head-to-head with Suede Thompson, while BHK will collide with “The Ultimate Finesser” Chris Bey! 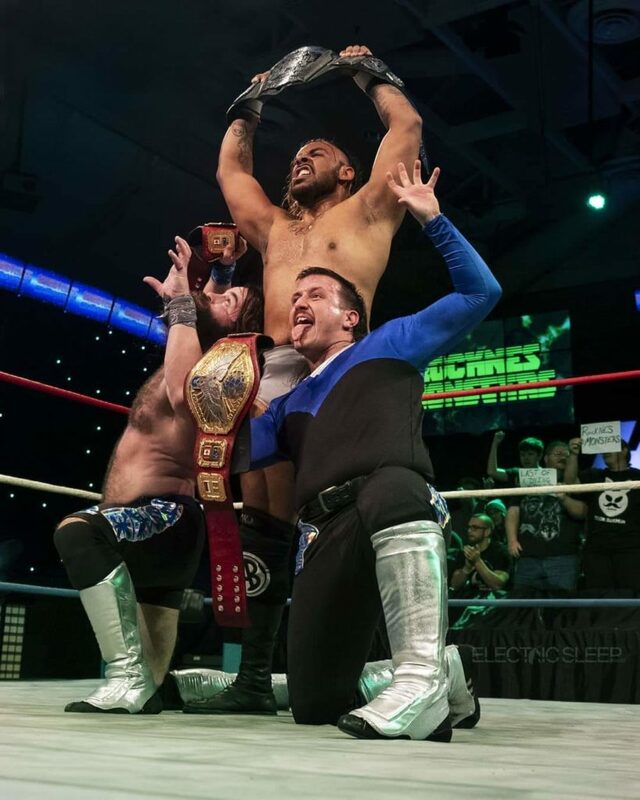 United Tag Team Champions ROCKNES MONSTERS with Hollywood Heritage Champion “Uptown” Andy Brown. Ever since capturing the Hollywood Heritage Title from Royce Isaacs, “Uptown” Andy Brown has vowed to be a fighting champion, accepting any and all challengers. Such a challenge rarely goes unnoticed, and Andy’s is no exception, as it has been answered by none other than “Hollywood’s Own” Joey Ryan! In the first semi-final match of the PP3 Memorial Cup Tournament, Bateman hit a miraculous elbow to a mid-flight Brandon Cutler, scoring him the win and a ticket to the finals. On February 10th, we will see the other half of the semi-finals, an East Coast vs. West Coast battle of speed and agility as Danny “Limelight” Rivera takes on Adrian Quest. Will Brooklyn’s native son go on to face The Main Man for the Cup, or will it be Young Fuego that represents SoCal in the finals? Admission is FREE, seats are first-come, first-served. For more information, follow CWFH’s social media channels, @CWFHollywood.